New year, new topic to post your screenshots. This time around, everyone should post a small version of the screenshot or it will be removed. You can upload your picture to sites like http://imageshack.us or http://photobucket.com or host your own screenshot + thumbnail. I will make links from the images of people who do not post a small version! Xfwm4 with inactive window transparency enabled. Bottom panel has a white -> transparent gradient png background. I really like that Theme . . . did you make it yourself? Great job !! /me gives Core Developer Nick a Gold-Star. 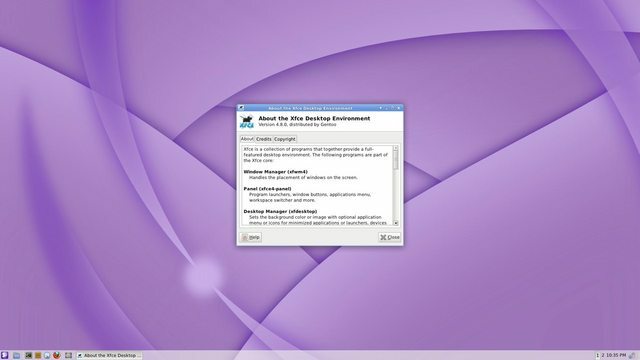 How did you get the pure-applications menu on your desktop? Did you edit the right click applications menu? "True sophistication and ingenuity comes from trying to solve complicated things by the simplest of means." Sorry for the delay in reply, just got home from work. A basic Debian 6.0 Squeeze with the Xfce desktop environment (staying with the 'stable' repros, for now) A simple, but informative Conky. 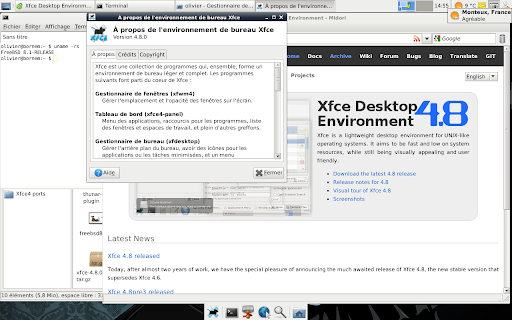 Just wanted to check out Xfce 4.8 so I put it up around a base install of Xubuntu 10.10, and ended up falling in love with it. I even installed the greybird theme thats gonna be available in Xubuntu 11.04. Im not real impressed with how quirky Xubuntu seems, but I just love Xfce 4.8! The new Debian 6.0 Squeeze with upgraded 2.6.37 Kernel (generic) and the new 4.8 Xfce desktop environment. Nothing fancy . . . I like simple, functional and minimal. I just want my desktop/OS to work and stay out of my way. Notice how the wallpaper stayed the same, but everything else was 'upgraded'? You need to turn off desktop icons in order to get the 'root' menu, last tab of the Desktop dialogue window. Using a simple Conky and the Xfce-panel ... of course, with a #!dark-theme and wallpaper. I'm not sure that is the official name. I think FVWM called it a root menu. I suspect it's simply called the applications menu, although that gets a little ambiguous once you consider the panel's Xfce menu. My current Xfce desktop on #!Crunchbang "Statler" OS ... using my Acer Aspire One 10" Netbook. Upgraded to the 2.6.38 kernel in x64. I love this wallpaper . . . using the Debian logo, but staying with #!Crunchbang's "dark and minimal" theme. How come 2011 is almost 1/2 over and the Xfce Screenshots Thread is still on the 1st page?? Come on, guys ... make some submissions for your favorite Desktop Environment. Wallpaper and menu icon are from gentoo-art.org. Style is Xfce-4.6, but with the default 4.8 Xfwm theme.